NOTICE: Activation key must be used on a valid Steam account, requires internet connection. ABOUT THE GAME Legends Unite! The Dynamic Duo of Batman and Robin join other famous super heroes from the DC Universe including Superman, Wonder Woman and Green Lantern to save Gotham City from destruction at the hands of the notorious villains Lex Luthor and the Joker. KEY FEATURES Collect 50 DC Com… ics characters Flex your new super abilities, and master new suits and gadgets. Explore Gotham City by walking, flying, unlocking and controlling a variety of cool vehicles And for the first time in a LEGO video game, hear the LEGO characters talk Enjoy the game with friends and family SYSTEM REQUIREMENTS MinimumIntel Core 2 Duo @ 2GHz or AMD Athlon 64 X2 3800+ - 2 * 2000 Mhz 1GB RAM Windows XP, Windows Vista or Windows 7Graphics Card: NVIDIA 7600, 7800, 8xxx or better, ATI 1950 or better RecommandedQuad core CPU @ 2.7 GHz2 GB RAM Graphics Card :NVIDIA 7600, 7800, 8xxx or better, ATI 1950 or better100% DirectX 9.0c compatible computerSound Card100% DirectX 9.0c compatible Audio DeviceInstallation requires 10GB of free hard disk space. 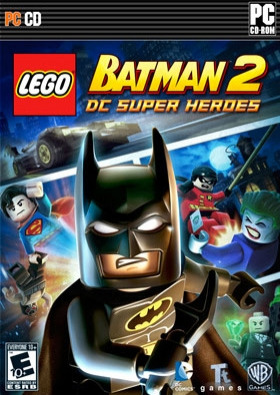 LEGO BATMAN 2: DC SUPER HEROES software © 2012 TT Games Publishing Ltd. Produced by TT Games under license from the LEGO Group. LEGO, the LEGO logo, the Brick and the Knob configurations and the Minifigure are trademarks of the LEGO Group. © 2012 The LEGO Group. All other trademarks and copyrights are the property of their respective owners. All rights reserved. Batman and all related characters, and elements are trademarks of and © DC Comics. © 2012. WB GAMES LOGO, WB SHIELD: ™ & © Warner Bros. Entertainment Inc.